Productive engagement of TCR results in delivering signals required for T cell proliferation as well as T cell survival. Blocking TCR-mediated survival signals, T cells undergo apoptosis instead of proliferation upon TCR stimulation. During the activation process, T cells produce IL-2, which acts as an extrinsic survival factor. In addition, TCR stimulation results in up-regulation of Bcl-xL to enhance T cell survival intrinsically. We show in this study that protein kinase C (PKC)-θ is required for enhancing the survival of activated CD4+ T cells by up-regulating Bcl-xL. In response to TCR stimulation, CD4+ PKC-θ−/− T cells failed to up-regulate Bcl-xL, and underwent accelerated apoptosis via a caspase- and mitochondria-dependent pathway. Similar to PKC-θ-deficient primary CD4+ T cells, small interfering RNA-mediated knockdown of PKC-θ in Jurkat cells also resulted in apoptosis upon TCR stimulation. Forced expression of Bcl-xL was sufficient to inhibit apoptosis observed in PKC-θ knockdown cells. Furthermore, ectopic expression of PKC-θ stimulated a reporter gene driven by a mouse Bcl-xL promoter. Whereas an inactive form of PKC-θ or knockdown of endogenous PKC-θ led to inhibition of Bcl-xL reporter. PKC-θ-mediated activation of Bcl-xL reporter was inhibited by dominant-negative IκB kinase β or dominant-negative AP-1. Thus, the PKC-θ-mediated signals may function not only in the initial activation of naive CD4+ T cells, but also in their survival during T cell activation by regulating Bcl-xL levels through NF-κB and AP-1 pathways. An efficient adaptive immune system requires the capability of rapid expansion as well as reduction of immune cells. T cells meet such requirements as they can be induced toward proliferation, anergy, or apoptosis dependent on the signals received via TCR. Naive T cells are activated to proliferate in response to foreign Ags, which is a critical step in adaptive immunity. Meanwhile, T cells are ready to undergo apoptosis or anergy when engaged with self Ags, which is an important mechanism for self-tolerance. T cells therefore have developed complicated mechanisms to balance the survival and apoptotic signals. Productive engagement of TCR leads to T cell activation, resulting in proliferation and production of IL-2. Proliferating T cells especially at S phase of the cell cycle are susceptible to apoptosis (1, 2). TCRs deliver signals that are required not only for stimulating proliferation, but also for enhancing survival (3, 4). Such survival signals ensure the completion of the T cell activation process essential for differentiating naive T cells to effectors that mediate actual immune responses (2). During T cell activation, survival of the T cells is enhanced by IL-2, which acts as an extrinsic survival factor. In addition, activated T cells substantially up-regulate Bcl-xL that intrinsically increases the ability of resistance to apoptosis (2, 5, 6). CD28, the costimulatory molecule, mediates the critical signals required for up-regulation of Bcl-xL during T cell activation (2, 4, 5). It was reported that distinct motifs within the cytoplasmic domain of CD28 regulate T cell proliferation and induction of Bcl-xL (7), suggesting differential signals are responsible for these two CD28-regulated biological effects. PI3K is required for CD28-mediated induction of Bcl-xL, as up-regulation of Bcl-xL is prevented by a pharmacological inhibitor of PI3K, and by mutation of the CD28 residues essential for PI3K activation (7, 8). Akt, a target of PI3K, has been shown to mediate T cell survival by regulating Bcl-xL most likely via activation of NF-κB (9). Furthermore, functional NF-κB binding sites were identified on the promoter region of Bcl-xL gene (10, 11). Therefore, the current model is that PI3K/Akt pathway-mediated activation of NF-κB is responsible for stimulating Bcl-xL expression, resulting in enhanced survival of T cells. In response to TCR stimulation, protein kinase C (PKC)3-θ is selectively translocated to the immunological synapse (12, 13) and mediates the critical signals required for T cell activation (14, 15, 16). By gene targeting, we, as well as Pfeifhofer et al. (15, 16), showed that among 11 different isoforms of the PKC family, PKC-θ is selectively required for T cell activation. Mature T cells obtained from PKC-θ−/− mice failed to proliferate and produce IL-2 upon TCR stimulation due to defective activation of NF-κB and AP-1, and these observations are supported by several in vitro studies in Jurkat T cells (17, 18, 19, 20). PKC-θ-mediated activation of NF-κB requires recruitment of signaling complexes containing the scaffold protein CARMA-1, the caspase recruitment domain-containing protein Bcl10, and the paracaspase MALT1 and PDK1 (21, 22). Li et al. (20) reported that PKC-θ activates AP-1 via stimulating a Ste20-related upstream MAPK Ste20-related proline-alanine-rich kinase. In addition, two recent articles demonstrated that PKC-θ stimulates NF-AT translocation to the nucleus by enhancing TCR-induced Ca2+ influx (15, 23). PKC-θ, therefore, regulates multiple signaling pathways critical for T cell activation. The unique role of PKC-θ in T cell activation is also indicated by the absence of similar defects in T cells deficient in other isoforms of PKC. In this study, we show that in addition to mediating T cell activation, PKC-θ is also required for enhancing CD4+ T cell survival during the activation process by up-regulating Bcl-xL. PKC-θ−/− mice were described previously (16, 24). Mice were maintained in the specific pathogen-free facility of University of Illinois following the university guidelines. The wild-type, constitutively active, or dominant-negative (DN) human PKC-θ expression vectors, and flag-tagged murine PKC-θ were gifts from X. Lin (M.D. Anderson Cancer Center, Houston, TX) and A. Altman (Division of Cell Biology, La Jolla Institute for Allergy and Immunology, San Diego, CA). Small interfering RNA (siRNA) for human PKC-θ was designed and synthesized, as described previously (24). A pSuper construct expressing a scrambled siRNA served as a control. AP-1 plasmids are gifts from Y. Hu (Department of Biochemistry and Molecular Genetics, School of Medicine, University of Virginia, Charlottesville, VA). Expression plasmids for IκB kinase (IKK)β and p65 were obtained from R. Ye (Department of Pharmacology, University of Illinois, Chicago, IL). Spleens and mesenteric lymph nodes were removed from 8- to 12-wk-old mice. Single-cell suspensions were then made by crushing organs through a cell strainer. RBC were lysed with ACK lysis buffer. Afterward, CD4+ cells were purified using CD4+ isolation kit (Miltenyi Biotec), according to manufacturer’s protocol. The purity of T cells, determined by flow cytometry, was >90%. Purified CD4+ T cells were cultured in a 96-well plate at 2 × 105 cells/well in 100 μl of RPMI 1640 medium supplemented with 10% FCS, 2 mM l-glutamine, 50 U/ml penicillin/streptomycin, and 50 mM 2-ME. Cells were then stimulated for 72 h by precoated 1 μg/ml anti-CD3ε Ab (clone 145-2C11; BD Pharmingen) and 2 μg/ml anti-CD28 (clone 37.51; BD Pharmingen). Murine rIL-2 (R&D Systems) was added, as indicated. Labeling of cells with CFSE (Molecular Probes) for measurement of the proliferative responses was performed, as described (25). The decline in CFSE fluorescence intensity was determined by FACS analysis. Purified splenic CD4+ T cells were cultured in the presence or absence of 25 U/ml mouse rIL-2 (R&D Systems) and stimulated, as described, in proliferation assay for various times. Cells were then washed once with ice-cold annexin V binding buffer (10 mM HEPES (pH 7.5), 140 mM NaCl, 5 mM KCl, 1 mM MgCl2, and 1.8 mM CaCl2) and stained with PE-conjugated annexin V and 7-aminoactinomycin D (BD Pharmingen), according to the manufacturer protocol. Detection of apoptotic cells was performed on a FACSCalibur with CellQuest software (BD Biosciences). As for Jurkat cells, 107 cells in 300 μl of serum-free medium were transfected by electroporation with 15 μg of the PKC-θ siRNA or scrambled siRNA expression plasmids together with 25 μg of the Bcl-xL or Bcl-2 expression plasmids. siRNA expression plasmid also contains a GFP gene driven by an independent promoter, so that the transfected cells can be monitored by GFP expression. Identical amounts of the corresponding parental vectors were used in controls to ensure equal amounts of DNA. After 24 h, cells were incubated for 18 h with OKT-3 (1 μg/ml) and anti-CD28 (2 μg/ml) and cross-linked with a secondary goat anti-mouse Ig (10 μg/ml). Percentage of apoptosis was measured by gating on the GFP-positive cells, as described above. To examine apoptosis by mitochondrial depolarization, cells were stained with 100 nM tetramethylrhodamine ethyl ester (TMRE; Molecular Probes). Fifteen minutes after staining, cells were washed once with ice-cold PBS, collected, and subjected to FACS analysis. A 1-kb Bcl-xL promoter element was cloned upstream of a luciferase gene (pGL2 vector), as described previously (26). Jurkat cells (107/ml) were transfected by electroporation with 5 μg of the Bcl-xL reporter or NF-κB or AP-1 luciferase reporter plasmid together with 15 μg of the PKC-θ siRNA or scrambled siRNA expression plasmids or 15 μg of different indicated expression plasmids. Identical amounts of the corresponding parental vectors were used in controls. For normalization, 100 ng of the Renilla luciferase reporter, pTK-Renilla-LUC, was used. After 36 h, cells were incubated for 8 h with OKT-3 (1 μg/ml) and anti-CD28 (2 μg/ml), and cross-linked with a secondary goat anti-mouse Ig (10 μg/ml). Cells were then lysed and assayed for dual luciferase activity (Promega). To determine whether PKC-θ plays a role in T cell survival, we first examined the apoptosis of the CD4+ T cell purified from PKC-θ−/− mice. Purified CD4+ T cells from wild-type and PKC-θ−/− mice were cultured in medium or stimulated with anti-CD3/28 Abs, and the apoptotic cells were then detected by annexin V (Fig. 1⇓a). Without stimulation, PKC-θ−/− CD4+ T cells displayed slightly, but consistently more apoptosis (∼5% more) than that of the wild-type mice. However, in response to CD3 and CD28 stimulation, PKC-θ−/− CD4+ T cells underwent rapid apoptosis compared with wild-type cells. Apoptosis of the PKC-θ−/− CD4+ T cells were effectively inhibited by treatment with IL-2 (5 ng/ml), a cytokine known to enhance T cell survival (6). Furthermore, the observed apoptosis was prevented by a pan-caspase inhibitor, zVAD. We then examined apoptosis in a time course. Spontaneous apoptosis was determined when T cells were not stimulated (Fig. 1⇓b). There was no significant difference in apoptosis of freshly isolated cells (0 h) between wild-type and PKC-θ−/− mice. After 24 or 48 h in medium, again slightly more apoptotic cells (∼5–10% more) were detected in PKC-θ−/− CD4+ T cells. However, in response to CD3 and CD28 stimulation, significantly more apoptotic cells were detected in CD4+ T cells obtained from PKC-θ−/− mice than that from wild-type mice at all the time points that we examined (Fig. 1⇓c). The difference in apoptosis between wild-type and PKC-θ−/− mice increased progressively with the time of stimulation. Approximately 80% of PKC-θ−/− CD4+ T cells were dead 48 h after TCR stimulation, whereas only about less than 30% of the wild-type T cells were dead. Altogether, these results suggest that PKC-θ-deficient CD4+ T cells possess an intrinsic defect in survival upon activation. TCR stimulation induced PKC-θ−/− CD4+ T cell apoptosis. a, CD4+ T cells purified from wild-type (WT) and PKC-θ−/− mice were left in medium (None) or subject to stimulation with anti-CD3 (1 μg/ml) and anti-CD28 (2 μg/ml) Abs. After 36 h, apoptotic cells were detected by flow cytometric analysis of annexin V staining cells. Percentage of annexin V-positive cells was indicated. Effects of IL-2 (5 ng/ml) or caspase inhibitor zVAD (50 μM) treatment on apoptosis of PKC-θ−/− CD4+ T cells were also determined. Numbers indicate the percentage of annexin V-positive cells. b, Spontaneous apoptosis. Wild-type (□) and PKC-θ−/− CD4+ (▪) T cells were left in medium for different times, and the apoptosis was then detected with annexin V. c, Increased apoptosis of PKC-θ−/− CD4+ T cells after TCR stimulation. Wild-type (□) and KC-θ−/− CD4+ (▪) T cells were stimulated with CD3/28 cross-linking for different times, and apoptosis was then detected with annexin V. d, Apoptosis of PKC-θ−/− DO11.10 T cells. Splenocytes obtained from DO11.10 (□) and PKC-θ−/− DO11.10 mice (▪) were left in medium (None) or subject to stimulation with OVA peptide (1 μg/ml) and/or IL-2 (5 ng/ml) for 36 h. Apoptotic cells were then detected by annexin V. e, Defective proliferation of PKC-θ−/− DO11.10 T cells. Splenocytes were either left in medium or stimulated with OVA peptide (1 μg/ml) and/or IL-2 (5 ng/ml) for 36 h. Activated cells were then pulsed with 1 μCi of [3H]thymidine for 18 h. f, Defective proliferation of PKC-θ−/− CD4+ T cells. CFSE-labeled wild-type and PKC-θ−/− CD4+ T cells were left in medium or stimulated with CD3/CD28 cross-linking or together with IL-2 (5 ng/ml). After 72 h, cell division was analyzed by a flow cytometer. Data shown are representative of at least three independent experiments. To determine whether PKC-θ−/− T cells stimulated with a ligand instead of Ab cross-linking undergo apoptosis, PKC-θ−/− mice were bred to TCR transgenic mice (DO11.10) that express TCRs with a single specificity for OVA. Splenocytes obtained from DO11.10 and PKC-θ−/− DO11.10 mice were stimulated with OVA peptide, and the apoptosis was then examined (Fig. 1⇑d). Similarly, TCR stimulation accelerated apoptosis of PKC-θ−/− DO11.10 T cells, and IL-2 treatment prevented apoptosis. Previously, we have concluded that PKC-θ−/− T cells are required for T cell proliferation in response to TCR stimulation based on the [3H]thymidine incorporation assay (16). We therefore examined [3H]thymidine incorporation of OVA-activated T cells (Fig. 1⇑e). Indeed, compared with the wild-type T cells, PKC-θ−/− DO11.10 T cells displayed defects in incorporating [3H]thymidine, confirming previous results. It is possible that the observed defective [3H]thymidine incorporation was due to apoptosis of the PKC-θ−/− T cells, but not due to defective proliferation. We therefore labeled CD4+ T cells with fluorescent dye, CFSE, which allows direct detection of T cell division by decreasing intensity of CFSE with each division (Fig. 1⇑f). Without stimulation, both wild-type and PKC-θ−/− T cells displayed a single CFSE peak, confirming lack of proliferation. In response to TCR stimulation, wild-type CD4+ T cells proliferated vigorously, as expected, indicated by five distinct CFSE peaks. Consistent with the role of IL-2 in stimulating T cell activation, proliferation of the wild-type T cells was further enhanced by IL-2 treatment (5 ng/ml). In contrast, the majority of the PKC-θ−/− CD4+ T cells did not proliferate in response to TCR stimulation. IL-2 treatment increased, but failed to rescue the defective proliferation to the wild-type levels. Thus, IL-2 treatment was able to separate apoptosis from defective proliferation. Altogether, our results showed that PKC-θ is required for both T cell proliferation and survival. To further analyze the apoptosis observed in PKC-θ−/− CD4+ T cells, we examined caspase-3 and mitochondria potential, two critical parameters for apoptosis. Above experiments have shown that zVAD can inhibit apoptosis, suggesting that caspases are involved. We therefore examined caspase-3, because activation of this caspase is believed to be a critical step in apoptosis. A significantly increased cleaved caspase-3, the active form of caspase-3, was detected in PKC-θ−/− CD4+ T cells stimulated with TCR cross-linking (Fig. 2⇓a), whereas no such increased cleaved caspase-3 was detected in wild-type T cells, confirming that PKC-θ−/− CD4+ T cells underwent apoptosis via a caspase-dependent pathway. PKC-θ−/− CD4+ T cells undergo apoptosis via caspase- and mitochondria-dependent pathways. a, Increased active caspase-3 product after TCR stimulation of PKC-θ−/− CD4+ T cells. Caspase-3 levels were determined by Western blot analysis of wild-type and PKC-θ−/− CD4+ T cells that were left in medium or stimulated with CD3/28 cross-linking for 12 h. Two bands representing procaspase-3 and cleaved caspase-3 are indicated. b, Analysis of apoptosis of PKC-θ−/− CD4+ T cells with TMRE. Wild-type and PKC-θ−/− CD4 T cells were left in medium or subjected to stimulation with CD3/CD28 cross-linking for 36 h. The apoptotic cells were then detected by flow cytometric analysis of TMRE staining. Percentage of TMRE-negative cells is indicated. TMRE was then used to detect mitochondrial depolarization that was usually associated with apoptosis (Fig. 2⇑b). In contrast with annexin V that stains apoptotic cells, TMRE stains only live cells, because binding to TMRE depends on mitochondrial membrane potential that is lost due to depolarization in the process of apoptosis. The majority of wild-type T cells either stimulated or unstimulated are TMRE positive, suggesting intact mitochondrial membrane potential in live cells. Without stimulation, the majority of the PKC-θ−/− CD4+ T cells were also TMRE positive. However, TCR stimulation led to significantly decreased TMRE staining for PKC-θ−/− CD4+ T cells, indicating mitochondrial depolarization, whereas IL-2, which was shown to inhibit PKC-θ−/− CD4+ T cell apoptosis (Fig. 1⇑a), prevented mitochondrial depolarization, indicated by the increased TMRE-positive population. These results strongly suggest that apoptosis of the PKC-θ−/− CD4+ T cells is a mitochondria-dependent process. Bcl-xL is known to be up-regulated to intrinsically increase T cell resistance to apoptosis during T cell activation (4, 6, 7). We therefore determined the role of PKC-θ in Bcl-xL up-regulation. CD4+ T cells purified from wild-type and PKC-θ-deficient mice were cultured in medium or stimulated with anti-CD3/28 Abs. Bcl-xL levels were determined by Western blot analysis (Fig. 3⇓a). As expected, wild-type T cells significantly up-regulated Bcl-xL in response to TCR cross-linking. Without stimulation, PKC-θ−/− CD4+ T cells had equivalent amounts of Bcl-xL as that of the wild type (Fig. 1⇑a). However, Bcl-xL levels in CD3/28-stimulated PKC-θ−/− CD4+ T cells were markedly reduced compared with the stimulated wild-type T cells, suggesting that PKC-θ-mediated TCR signals are required for stimulating Bcl-xL expression. Furthermore, in the presence of IL-2 that was shown to inhibit apoptosis, Bcl-xL levels were not significantly changed, suggesting that IL-2 rescued apoptosis most likely via a Bcl-xL-independent mechanism. We also examined levels of Bcl-2, another antiapoptotic molecule with high degree of homology with Bcl-xL (Fig. 3⇓b). In contrast to Bcl-xL, there was no obvious up-regulation of Bcl-2 in response to TCR stimulation. More importantly, there was no significant difference in Bcl-2 levels between wild-type and PKC-θ−/− T cells. Consistent with a previous report (27), Bcl-2 is up-regulated by IL-2 treatment, which may partially explain IL-2-mediated rescue of PKC-θ−/− T cell apoptosis. Previously, we have shown that PKC-θ is required for activation of NF-κB and AP-1 (16); we thus examined nuclear translocation of both transcription factors in response to TCR stimulation by bandshift analysis (Fig. 3⇓c). Indeed, PKC-θ−/− CD4+ T cells displayed defective nuclear translocation of NF-κB and AP-1. These results suggest that PKC-θ is specifically required for Bcl-xL up-regulation as well as activation of NF-κB and AP-1 pathways. Failed full up-regulation of Bcl-xL in PKC-θ−/− CD4+ T cells. a, Bcl-xL levels were determined by Western blot analysis of wild-type and PKC-θ−/− CD4+ T cells that were left in medium or stimulated with CD3/28 cross-linking and/or IL-2 for 24 h. b, Bcl-2 levels were determined by Western blot analysis of wild-type and PKC-θ−/− CD4+ T cells that were left in medium or stimulated with anti-CD3 and anti-CD28 Abs alone or together with IL-2 for 24 h. Actin serves as a control for equal loading. 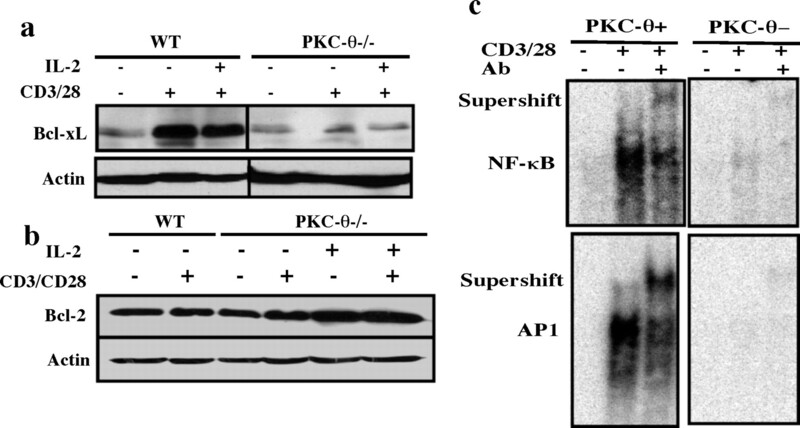 c, Defective nuclear translocation of NF-κB and AP-1. Nuclear extracts were prepared before and after TCR stimulation. Nuclear extracts were then subject to bandshift analysis using probes specific for NF-κB (top panel) and AP-1 (bottom panel). Abs specific for the corresponding transcription factors were used in supershift assays. Data shown are representative of at least three independent experiments. To determine the mechanisms underlying PKC-θ-mediated activation of Bcl-xL, we used a luciferase reporter driven by a Bcl-xL promoter (Fig. 4⇓a). Bcl-xL reporter was first introduced into Jurkat cells that up-regulate endogenous Bcl-xL in response to TCR stimulation (10). Correspondingly, TCR stimulation also moderately stimulated Bcl-xL reporter activity. PKC-θ expression plasmid was then cotransfected into Jurkat cells with Bcl-xL reporter. Surprisingly, PKC-θ greatly stimulated Bcl-xL reporter even in the absence of any stimulation, suggesting that ectopic expression of PKC-θ alone is sufficient to stimulate Bcl-xL reporter. The maximum activity was obtained when Jurkat cells were stimulated by cross-linking TCR in the presence of exogenous PKC-θ. Inactive PKC-θ, however, prevented TCR cross-linking-induced activation of Bcl-xL reporter, suggesting that kinase activity of PKC-θ is required. Previously, we have developed siRNA-based technology to successfully knock down endogenous PKC-θ in Jurkat cells (24). To examine the role of endogenous PKC-θ in the regulation of Bcl-xL, endogenous PKC-θ was knocked down using pSuper plasmid expressing PKC-θ specific siRNA, as described previously (Fig. 4⇓b) (24). Indeed, knockdown of PKC-θ inhibited TCR stimulation-induced activation of Bcl-xL reporter, suggesting that PKC-θ is required for activation of Bcl-xL reporter (Fig. 4⇓a). These results suggest that PKC-θ-mediated signals are sufficient and necessary for enhancing Bcl-xL expression by stimulating its promoter activity in T cells. PKC-θ regulates Bcl-xL reporter activity. a, A luciferase reporter under the control of a Bcl-xL promoter was transfected into Jurkat cells alone (reporter) or together with expression plasmid encoding wild-type PKC-θ or inactive PKC-θ or PKC-θ siRNA. Twenty-four hours after transfection, cells were either left in medium (□) or stimulated with anti-CD3 and anti-CD28 Abs (▪) for 8 h. Bcl-xL-luciferase reporter activity is indicated as fold induction relative to the activity obtained from unstimulated cells in control group. b, Control pSuper or pSuper encoding PKC-θ siRNA were transfected into Jurkat cells. Western blot analysis was then performed to detect PKC-θ expression (top panel). Bottom panel, Shows the expression of actin serving as a control for equal loading. Data shown are representative of at least three independent experiments. Previously, we have shown that PKC-θ regulates both NF-κB and AP-1 pathways (16, 24). We therefore determined the role of PKC-θ-mediated activation of NF-κB and AP-1 in the regulation of Bcl-xL. We first determined whether manipulation of NF-κB pathway affects Bcl-xL reporter activity (Fig. 5⇓a). IKKβ is responsible for phosphorylating IκB, which results in degradation of IκB and translocation of NF-κB to the nucleus to stimulate gene expression (28). Forced expression of IKKβ or p65 subunit of NF-κB greatly enhanced TCR stimulation-induced Bcl-xL reporter activity, whereas a DN-IKKβ, which is an inactive kinase due to a mutation at the ATG binding site, prevented activation of Bcl-xL reporter, strongly suggesting the positive role of NF-κB pathway in the regulation of Bcl-xL. As controls, IKKβ was shown to stimulate, and DN-IKKβ inhibited NF-κB reporter activity (Fig. 5⇓b). PKC-θ regulates Bcl-xL reporter activity via NF-κB and AP-1 pathways. a, Regulation of Bcl-xL reporter by NF-κB pathway. Bcl-xL reporter was introduced into Jurkat cells alone (reporter) or together with expression plasmid encoding IKKβ or p65 or DN-IKKβ. Thirty-six hours after transfection, cells were either left in medium (□) or stimulated with anti-CD3 and anti-CD28 Abs (▪) for 8 h. Luciferase assays were performed using cell lysate. b, NF-κB luciferase reporter was introduced into Jurkat cells together with expression plasmid for IKKβ or DN-IKKβ. c, Stimulation of Bcl-xL reporter by AP-1. Bcl-xL reporter was introduced into Jurkat cells alone (reporter) or together with expression plasmid encoding AP-1 (c-Fos and c-Jun). Cells were then stimulated, as described in a. d, AP-1 luciferase reporter was introduced into Jurkat cells together with expression plasmid for AP-1 or DN-AP-1. e, PKC-θ stimulates Bcl-xL reporter via NF-κB and AP-1 pathways. Bcl-xL reporter activity was measured in the presence of PKC-θ alone or together with DN-IKKβ or DN-AP-1. 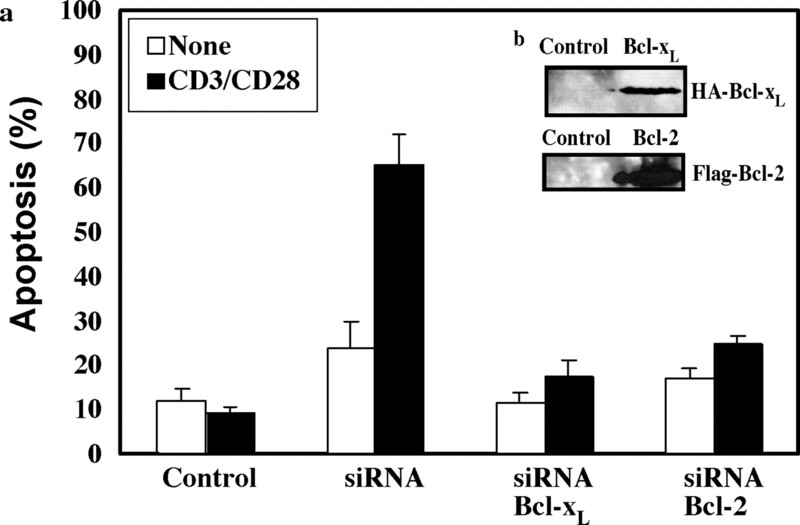 Stimulation of cells with anti-CD3 and anti-CD28 Abs was performed, as described in a. Bcl-xL-luciferase reporter activity is indicated as fold induction relative to the activity obtained from unstimulated cells in control group. The major two components of AP-1, c-Fos and c-jun, heterodimerize to bind to the target DNA (AP-1 binding site) and regulate gene expression (29). To determine the role of AP-1 in the regulation of Bcl-xL, expression plasmids encoding both c-Fos and c-Jun were transfected into Jurkat cells together with Bcl-xL reporter (Fig. 5⇑c). AP-1 markedly stimulated TCR cross-linking-induced Bcl-xL reporter activity, suggesting that AP-1 also activates Bcl-xL promoter in addition to NF-κB. As a control, AP-1 was also shown to stimulate AP-1 reporter (Fig. 5⇑d). To determine whether PKC-θ-mediated activation of Bcl-xL depends on NF-κB and AP-1 pathways, we used DN-IKKβ and DN-AP-1. DN-AP-1 lacks aa 3–122 of c-jun, and thus is missing the major trans activation domain of c-jun, but retains the DNA binding and leucine zipper domain. DN-AP-1 is thus able to bind to DNA, but cannot stimulate transcription, as previously described (30, 31). To demonstrate that DN-IKKβ and DN-AP-1 function as expected, DN-IKKβ and DN-AP-1 were first shown to inhibit TCR stimulation-induced activation of NF-κB reporter (Fig. 5⇑b) and AP-1 reporter (Fig. 5⇑d) correspondingly. The effects of DN-IKKβ and DN-AP-1 on PKC-θ-mediated activation of Bcl-xL reporter were then evaluated. Consistent with above results (Fig. 4⇑), PKC-θ stimulated Bcl-xL reporter activity (Fig. 5⇑e). 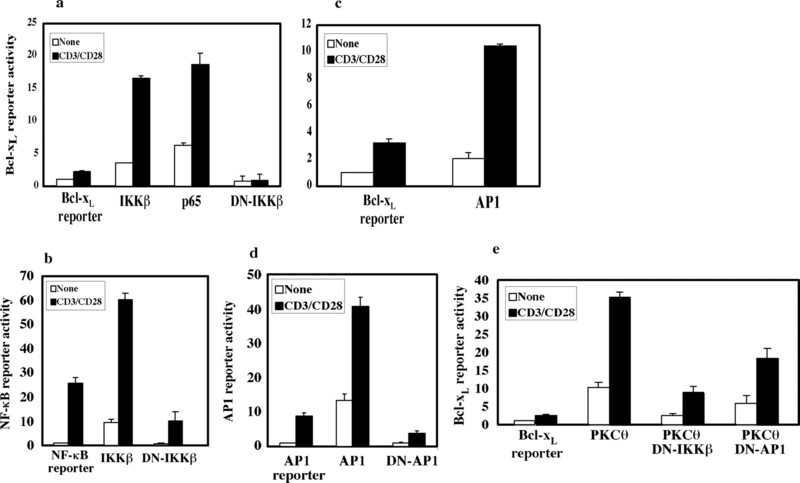 However, DN-IKKβ or DN-AP-1 greatly inhibited PKC-θ-stimulated Bcl-xL reporter activity before or after TCR cross-linking, suggesting that PKC-θ-mediated activation of Bcl-xL reporter depends on both NF-κB and AP-1 pathways. To determine whether lack of Bcl-xL is responsible for the apoptosis observed in the absence of PKC-θ, we first examined whether TCR stimulation induces apoptosis in PKC-θ knockdown Jurkat cells (Fig. 6⇓a). With or without TCR stimulation, wild-type Jurkat cells did not display obvious apoptosis. Knockdown of PKC-θ with siRNA resulted in an increased spontaneous apoptosis. Furthermore, TCR stimulation accelerated apoptosis of PKC-θ knockdown Jurkat cells. These results are in agreement with the observation in PKC-θ null mice (Fig. 1⇑a). We next determined whether forced expression of Bcl-xL can prevent the apoptosis resulted from knockdown of PKC-θ. Expression plasmid encoding hemagglutinin (HA)-tagged Bcl-xL was cotransfected into Jurkat cells together with PKC-θ siRNA. Thus, expression of the transfected Bcl-xL could be detected with an anti-HA-specific Ab (Fig. 6⇓b). Consistent with the role of Bcl-xL in preventing spontaneous apoptosis, Bcl-xL reduced the spontaneous apoptosis of PKC-θ knockdown Jurkat cells to the levels of wild-type cells. Moreover, Bcl-xL inhibited TCR stimulation-induced apoptosis in PKC-θ knockdown cells. Similar results were obtained when Bcl-2 was expressed in PKC-θ knockdown Jurkat cells. These results suggest that forced expression of Bcl-xL is sufficient to rescue the apoptosis resulted from lack of PKC-θ. Ectopic expression of Bcl-xL or Bcl-2 prevented apoptosis resulting from lack of PKC-θ. a, Jurkat cells were transfected with pSuper plasmid encoding either scrambled siRNA (control) or PKC-θ-specific siRNA and expression plasmid encoding Bcl-xL or Bcl-2. Forty-eight hours after transfection, Jurkat cells were either left in medium unstimulated (None, □) or stimulated with anti-CD3 and anti-CD28 Abs (▪) for 18 h. Apoptosis was detected by annexin V staining. b, Expression of HA-tagged Bcl-xL (upper panel) and Flag-tagged Bcl-2 (bottom panel) was detected by Western blot analysis with corresponding anti-HA and Flag Abs. Using PKC-θ-deficient mice and knockdown of PKC-θ, we show that PKC-θ-mediated signals enhance CD4+ T cell survival. Compared with the wild-type T cells, PKC-θ−/− CD4+ T cells are more sensitive to apoptosis. PKC-θ−/− CD4+ T cells displayed a slightly, but consistently increased spontaneous apoptosis. However, in response to TCR stimulation, PKC-θ−/− CD4+ T cells failed to up-regulate the survival factor, Bcl-xL, and underwent extensive apoptosis. Barouch-Bentov et al. (32) reported recently that CD8+ T cell survival, but not proliferation, is regulated by PKC-θ via Bcl-2 as well as Bcl-xL. In contrast to CD8+ T cells, we show in this study that PKC-θ is required for both proliferation and survival of CD4+ T cells. PKC-θ specifically regulates Bcl-xL, but had no obvious effects on Bcl-2 in CD4+ T cells. We further show that wild-type PKC-θ, but not the DN-PKC-θ potentiated the activity of a luciferase reporter driven by a Bcl-xL promoter. PKC-θ-mediated activation of Bcl-xL reporter was inhibited by DN-IKKβ and AP-1, strongly suggesting that PKC-θ enhances Bcl-xL expression via activating NF-κB and AP-1 pathways. Engagement of TCR initiates a cascade of signals required for T cell activation, resulting in T cell proliferation. Because proliferating T cells are very susceptible to apoptosis (1, 2), TCR also transduces signals to enhance T cell survival during the activation process (2, 6). Previous studies including ours have indicated a critical role of PKC-θ in T cell activation (14, 15, 16), because PKC-θ−/− T cells failed to proliferate and produce IL-2 in response to TCR stimulation. In this study, we show that in the absence of PKC-θ, T cells undergo massive apoptosis instead of proliferation in response to TCR stimulation. This result suggests that PKC-θ also mediates the survival signals in addition to the signals required for T cell activation. Indeed, up-regulation of Bcl-xL, a critical survival factor, is defective in PKC-θ−/− T cells. Apoptosis of the PKC-θ−/− T cells was rescued by IL-2 treatment, suggesting that IL-2-mediated survival is independent of PKC-θ. This result also suggests that PKC-θ-mediated survival is not the only pathway to ensure survival of activated T cells, and other pathways such as IL-2 can compensate for the function of PKC-θ in T cell survival. Because PKC-θ is also required for IL-2 production (16), PKC-θ thus enhances T cell survival by stimulating the production of an extrinsic survival factor, IL-2, and by up-regulating Bcl-xL, which intrinsically protects T cells from apoptosis. Bcl-xL and Bcl-2 are both antiapoptotic molecules with high degree of homology. Although Bcl-2 is broadly expressed in different tissues, Bcl-xL is usually induced by stimulation (33). In agreement with this notion, Bcl-2 is kept at a relatively consistent level, whereas Bcl-xL is significantly up-regulated. Bcl-2 protects naive T cells from spontaneous apoptosis, but does not seem to play a major role in the survival of activated T cells, because deletion of Bcl-2 gene had no obvious effect on activated T cells (34). Consistent with this, we did not detect a significant change in Bcl-2 levels during T cell activation. Most studies agreed that Bcl-xL, which is significantly up-regulated during T cell activation, provides survival function for activated T cells (6). However, a recent report using conditional deletion of Bcl-xL suggested that Bcl-xL is dispensable for the survival of activated T cells (35). An increased level of Bcl-2 was observed in above Bcl-xL-deficient mice, which is consistent with previous reports that there is an inverse correlation between the levels of Bcl-2 and Bcl-xL (26, 36, 37). It is therefore to be determined whether up-regulated Bcl-2 compensated for the function of Bcl-xL. In agreement with most previous results, we detected greatly up-regulated Bcl-xL and no obvious apoptosis in wild-type T cells stimulated by cross-linking TCR. However, in response to TCR stimulation, PKC-θ−/− T cells underwent rapid apoptosis accompanied by greatly reduced levels of Bcl-xL. Furthermore, forced expression of Bcl-xL rescued apoptosis of PKC-θ−/− T cells. Our results thus support an essential role of PKC-θ-mediated up-regulation of Bcl-xL in enhancing the survival of activated T cells. There is considerable evidence that TCR-mediated activation of NF-κB up-regulates Bcl-xL to extend T cell survival (8, 38). However, previous studies focused on the activation of NF-κB by PI3K/Atk pathway. Bcl-xL up-regulation was prevented by PI3K inhibitor, and by mutating Y170 of CD28 that disrupted interaction with PI3K (7, 8). Akt is the best studied target of PI3K, and a survival factor. Transgenic expression of Akt resulted in up-regulated Bcl-xL and increased activation of NF-κB (9), mimicking the effect of TCR stimulation on Bcl-xL. A functional NF-κB binding site was also identified on the Bcl-xL promoter region (10, 11). These results appear to suggest that activation of NF-κB via PI3K/Akt pathway leads to transcriptional activation of Bcl-xL. However, Kane et al. (39) noticed that Akt alone slightly stimulated NF-κB reporter; optimal stimulation of NF-κB required a second signal. Our previous results clearly show that PKC-θ is specifically required for NF-κB activation in T cells (16). It is thus possible that PKC-θ provides the second signal for optimal NF-κB activation. This notion is supported by the observation that the second signal required for Akt to induce NF-κB could be provided by a low concentration of phorbol ester, a PKC-θ activator. Furthermore, Krumbock and colleagues (40) reported that PKC-θ is physically and functionally coupled to Akt. We showed in this study that Bcl-xL was not sufficiently up-regulated to maintain T cell survival in the presence of Akt, but in the absence of PKC-θ. PKC-θ is thus required to boost both Bcl-xL expression and NF-κB activation to the optimal levels. In addition, PKC-θ-mediated stimulation of Bcl-xL promoter activity was inhibited by DN-IKKβ, suggesting that PKC-θ regulates Bcl-xL expression via NF-κB pathway. It is likely that PKC-θ collaborates with Akt in activating NF-κB required for optimal Bcl-xL expression. Activation of NF-κB pathway with expression of IKKβ or p65 stimulates Bcl-xL reporter activity, but not up to the levels achieved by expressing PKC-θ (Fig. 5⇑), suggesting that other PKC-θ-regulated pathways, in addition to NF-κB, are also involved in the regulation of Bcl-xL. This notion is further supported by the fact that DN-IKKβ, which abolished IKKβ or p65-mediated stimulation of Bcl-xL reporter (Fig. 5⇑a), failed to completely inhibit PKC-θ-induced activation of Bcl-xL reporter (Fig. 5⇑e). Our results suggest that AP-1 pathway is also required for optimal activation of Bcl-xL by PKC-θ, as DN-AP-1 partially inhibited PKC-θ-mediated activation of Bcl-xL reporter. DN-NF-κB and DN-AP-1 together further inhibited, but did not abolish Bcl-xL reporter activity (data not shown). We thus examined NF-AT pathway, which is also regulated by PKC-θ (15, 23, 24). DN-NF-AT did not have obvious effects on Bcl-xL reporter (data not shown). PKC-θ thus regulates Bcl-xL expression at least via NF-κB and AP-1 pathways. The other possible effector of PKC-θ in the regulation of T cell survival is BAD. BAD translocates to mitochondria and heterodimerizes with Bcl-xL to promote cell death (41). However, phosphorylated BAD is not able to translocate and interacts with Bcl-xL. PKC-θ has been shown to increase T cell resistance to Fas-mediated apoptosis by phosphorylating BAD (42). Similarly, Akt was also reported to be able to phosphorylate BAD (43, 44). It would be interesting to examine the phosphorylation status of BAD in PKC-θ−/− mice. By generating PKC-θ null mice, we and others demonstrated that PKC-θ is required for T cell activation (15, 16). In this study, we identified additional function of PKC-θ in the regulation of survival of activated CD4+ T cells by up-regulating Bcl-xL. PKC-θ is thus a critical molecule that synchronizes the signals required for T cell activation and survival. By doing so, PKC-θ ensures the survival chance of activated T cells that mediate the actual immune responses. We thank Drs. Amnon Altman and Xin Lin for providing expression plasmids of various isoforms of PKCs, Dr. Reuven Agami for the pSuper plasmids, Dr. Yanfen Hu for AP-1 expression plasmids, Dr. Richard Ye for IKKβ expression plasmids, Dr. Stanley Koresmeyer for Bcl-xL and Bcl-2 expression plasmids and Bcl-xL reporter, and Dr. Prasad Kanteti for critically reading the manuscript and helpful discussion. ↵1 This work was supported by grants from American Cancer Society of Illinois Division, Schweppe Foundation, University of Illinois Cancer Center and Institutional Review Board, and National Institutes of Health (R01-AI053147-01). ↵3 Abbreviations used in this paper: PKC, protein kinase C; DN, dominant negative; HA, hemagglutinin; IKK, IκB kinase; siRNA, small interfering RNA; TMRE, tetramethylrhodamine ethyl ester. Boehme, S. A., M. J. Lenardo. 1993. Propriocidal apoptosis of mature T lymphocytes occurs at S phase of the cell cycle. Eur. J. Immunol. 23: 1552-1560. Radvanyi, L. G., Y. Shi, H. Vaziri, A. Sharma, R. Dhala, G. B. Mills, R. G. Miller. 1996. CD28 costimulation inhibits TCR-induced apoptosis during a primary T cell response. J. Immunol. 156: 1788-1798. Van Parijs, L., A. Ibraghimov, A. K. Abbas. 1996. The roles of costimulation and Fas in T cell apoptosis and peripheral tolerance. Immunity 4: 321-328. Noel, P. J., L. H. Boise, J. M. Green, C. B. Thompson. 1996. CD28 costimulation prevents cell death during primary T cell activation. J. Immunol. 157: 636-642. Burr, J. S., N. D. Savage, G. E. Messah, S. L. Kimzey, A. S. Shaw, R. H. Arch, J. M. Green. 2001. Cutting edge: distinct motifs within CD28 regulate T cell proliferation and induction of Bcl-xL. J. Immunol. 166: 5331-5335. Collette, Y., D. Razanajaona, M. Ghiotto, D. Olive. 1997. CD28 can promote T cell survival through a phosphatidylinositol 3-kinase-independent mechanism. Eur. J. Immunol. 27: 3283-3289. Jones, R. G., M. Parsons, M. Bonnard, V. S. Chan, W. C. Yeh, J. R. Woodgett, P. S. Ohashi. 2000. Protein kinase B regulates T lymphocyte survival, nuclear factor κB activation, and Bcl-xL levels in vivo. J. Exp. Med. 191: 1721-1734. Chen, C., L. C. Edelstein, C. Gelinas. 2000. The Rel/NF-κB family directly activates expression of the apoptosis inhibitor Bcl-xL. Mol. Cell. Biol. 20: 2687-2695. Khoshnan, A., C. Tindell, I. Laux, D. Bae, B. Bennett, A. E. Nel. 2000. The NF-κB cascade is important in Bcl-xL expression and for the anti-apoptotic effects of the CD28 receptor in primary human CD4+ lymphocytes. J. Immunol. 165: 1743-1754. Monks, C. R., H. Kupfer, I. Tamir, A. Barlow, A. Kupfer. 1997. Selective modulation of protein kinase C-θ during T-cell activation. Nature 385: 83-86. Altman, A., N. Isakov, G. Baier. 2000. Protein kinase Cθ: a new essential superstar on the T-cell stage. Immunol. Today 21: 567-573. Pfeifhofer, C., K. Kofler, T. Gruber, N. G. Tabrizi, C. Lutz, K. Maly, M. Leitges, G. Baier. 2003. Protein kinase Cθ affects Ca2+ mobilization and NFAT cell activation in primary mouse T cells. J. Exp. Med. 197: 1525-1535. Baier-Bitterlich, G., F. Uberall, B. Bauer, F. Fresser, H. Wachter, H. Grunicke, G. Utermann, A. Altman, G. Baier. 1996. Protein kinase C-θ isoenzyme selective stimulation of the transcription factor complex AP-1 in T lymphocytes. Mol. Cell. Biol. 16: 1842-1850. Coudronniere, N., M. Villalba, N. Englund, A. Altman. 2000. NF-κB activation induced by T cell receptor/CD28 costimulation is mediated by protein kinase C-θ. Proc. Natl. Acad. Sci. USA 97: 3394-3399. Lin, X., A. O’Mahony, Y. Mu, R. Geleziunas, W. C. Greene. 2000. Protein kinase C-θ participates in NF-κB activation induced by CD3-CD28 costimulation through selective activation of IκB kinase β. Mol. Cell. Biol. 20: 2933-2940. Li, Y., J. Hu, R. Vita, B. Sun, H. Tabata, A. Altman. 2004. SPAK kinase is a substrate and target of PKCθ in T-cell receptor-induced AP-1 activation pathway. EMBO J. 23: 1112-1122. Thome, M.. 2004. CARMA1, BCL-10 and MALT1 in lymphocyte development and activation. Nat. Rev. Immunol. 4: 348-359. Lee, K. Y., F. D’Acquisto, M. S. Hayden, J. H. Shim, S. Ghosh. 2005. PDK1 nucleates T cell receptor-induced signaling complex for NF-κB activation. Science 308: 114-118. Altman, A., S. Kaminski, V. Busuttil, N. Droin, J. Hu, Y. Tadevosyan, R. A. Hipskind, M. Villalba. 2004. Positive feedback regulation of PLCγ1/Ca2+ signaling by PKCθ in restimulated T cells via a Tec kinase-dependent pathway. Eur. J. Immunol. 34: 2001-2011. Manicassamy, S., M. Sadim, R. Ye, Z. Sun. 2006. Differential roles of PKC-θ in the regulation of intracellular calcium concentration in primary T cells. J. Mol. Biol. 355: 347-559. Xie, H., Z. Huang, M. Sadim, Z. Sun. 2005. Stabilized β-catenin extends thymocyte survival by up-regulating Bcl-xL. J. Immunol. 175: 7981-7988. Lord, J. D., B. C. McIntosh, P. D. Greenberg, B. H. Nelson. 1998. The IL-2 receptor promotes proliferation, bcl-2 and bcl-x induction, but not cell viability through the adapter molecule Shc. J. Immunol. 161: 4627-4633. Li, Z. W., R. C. Rickert, M. Karin. 2004. Genetic dissection of antigen receptor induced-NF-κB activation. Mol. Immunol. 41: 701-714. Karin, M., Z. Liu, E. Zandi. 1997. AP-1 function and regulation. Curr. Opin. Cell Biol. 9: 240-246. Brown, P. H., R. Alani, L. H. Preis, E. Szabo, M. J. Birrer. 1993. Suppression of oncogene-induced transformation by a deletion mutant of c-jun. Oncogene 8: 877-886. Ghosh, S., Y. Wu, R. Li, Y. Hu. 2005. Jun proteins modulate the ovary-specific promoter of aromatase gene in ovarian granulosa cells via a cAMP-responsive element. Oncogene 24: 2236-2246. Barouch-Bentov, R., E. E. Lemmens, J. Hu, E. M. Janssen, N. M. Droin, J. Song, S. P. Schoenberger, A. Altman. 2005. Protein kinase C-θ is an early survival factor required for differentiation of effector CD8+ T cells. J. Immunol. 175: 5126-5134. Grad, J. M., X. R. Zeng, L. H. Boise. 2000. Regulation of Bcl-xL: a little bit of this and a little bit of STAT. Curr. Opin. Oncol. 12: 543-549. Nakayama, K., L. B. Dustin, D. Y. Loh. 1995. T-B cell interaction inhibits spontaneous apoptosis of mature lymphocytes in Bcl-2-deficient mice. J. Exp. Med. 182: 1101-1109. Ma, A., J. C. Pena, B. Chang, E. Margosian, L. Davidson, F. W. Alt, C. B. Thompson. 1995. Bcl-x regulates the survival of double-positive thymocytes. Proc. Natl. Acad. Sci. USA 92: 4763-4767. Chao, D. T., G. P. Linette, L. H. Boise, L. S. White, C. B. Thompson, S. J. Korsmeyer. 1995. Bcl-xL and Bcl-2 repress a common pathway of cell death. J. Exp. Med. 182: 821-828. Kane, L. P., V. S. Shapiro, D. Stokoe, A. Weiss. 1999. Induction of NF-κB by the Akt/PKB kinase. Curr. Biol. 9: 601-604. Bauer, B., N. Krumbock, F. Fresser, F. Hochholdinger, M. Spitaler, A. Simm, F. Uberall, B. Schraven, G. Baier. 2001. Complex formation and cooperation of protein kinase Cθ and Akt1/protein kinase Bα in the NF-κB transactivation cascade in Jurkat T cells. J. Biol. Chem. 276: 31627-31634. Zha, J., H. Harada, E. Yang, J. Jockel, S. J. Korsmeyer. 1996. Serine phosphorylation of death agonist BAD in response to survival factor results in binding to 14-3-3 not Bcl-xL. Cell 87: 619-628. Villalba, M., P. Bushway, A. Altman. 2001. Protein kinase C-θ mediates a selective T cell survival signal via phosphorylation of BAD. J. Immunol. 166: 5955-5963. Del Peso, L., M. Gonzalez-Garcia, C. Page, R. Herrera, G. Nunez. 1997. Interleukin-3-induced phosphorylation of BAD through the protein kinase Akt. Science 278: 687-689. Datta, S. R., H. Dudek, X. Tao, S. Masters, H. Fu, Y. Gotoh, M. E. Greenberg. 1997. Akt phosphorylation of BAD couples survival signals to the cell-intrinsic death machinery. Cell 91: 231-241.